The country is using science for economic benefit. Neil Savage is a science writer in Lowell, Massachusetts. The imposing orange robot arm bends, picks up a car part, swings around and deposits it in another spot. This large, moving collection of gears and metal is not the sort of thing most factory workers would want to get too close to; being struck by the arm, which can move at speeds up to two metres per second, might crack their skulls. But the researcher showing off the set-up reaches his arm into the robot’s range of motion, delineated by black and yellow tape on the floor, and the robot slows to a stop. 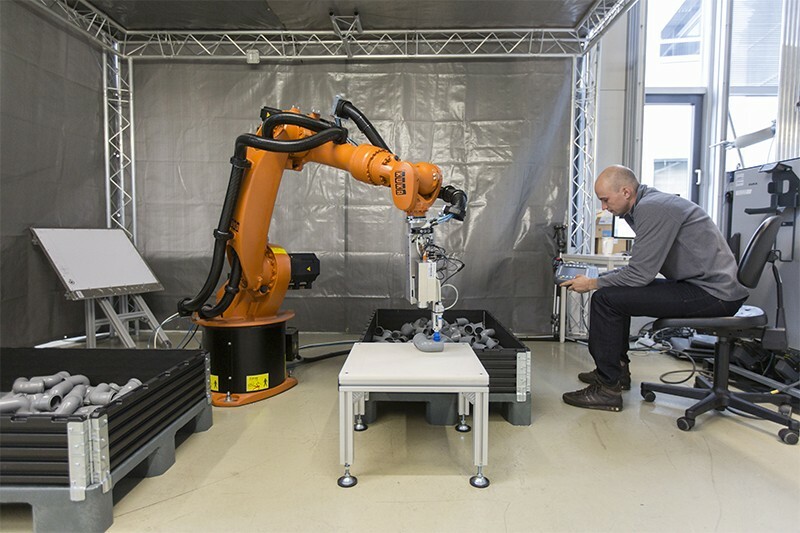 The mechanical arm is part of a project to create protocols for human–robot collaboration at the Fraunhofer Institute for Machine Tools and Forming Technology (IWU) in Chemnitz, Germany. Using cameras to detect the position of both the person and the machine, researchers have developed algorithms to slow or stop the robot when a human is in harm’s way. The aim was to make the robot safer so that it can work more closely with people in factory settings, for instance by fetching parts and handing them to workers. The system was first demonstrated in 2016, and has since been adopted by Geberit, a Swiss toilet manufacturer. The effort is emblematic of the emphasis Germany puts on translating research into practical applications, from software to pharmaceuticals (see ‘The high-tech strategy’). Such translation is seen as an engine for job growth, as well as a way to use the fruits of German research to benefit society, bringing knowledge and innovation out of the laboratory and into the world. The government’s commitment to applying scientific research is unusually strong; not only does it help to fund research institutions like Fraunhofer, it also supports the creation of start-up companies and the licensing of intellectual property to help researchers build careers outside academia. A federal agency that is set to launch in 2019 will spend €1 billion (US$1.14 billion) over 10 years to encourage breakthrough innovations. Moving research from the bench to the marketplace can bolster Germany’s economy, improve people’s quality of life and address worldwide health and environmental issues. Those, at least, are the reasons the German government gives for promoting its high-tech strategy. “The goal is for good ideas to be translated quickly into innovative products and services,” reads the website of the Federal Ministry of Education and Research. The strategy, previously slated to run until 2020, was extended in September 2018 to 2025. Its aim is that 3.5% of gross domestic product — one-third from government and two-thirds from the private sector — will be devoted to research and development (R&D). Areas of focus include the digital economy, sustainable energy, changes in the workplace, healthy living, improved transportation and secure infrastructure. The government is also working to make the transfer of knowledge between university and industry easier, and to make Germany friendlier for start-up firms and for foreign workers. The IWU has several programmes that are designed to improve manufacturing processes for cars and other goods. Researchers collaborate with companies such as Volkswagen, Porsche and BMW on projects that last anywhere from two months to three years, with the hope that what they come up with will be adopted by industry. “It’s very important for us to bring our research into industrial production,” says Michael Kuhl, former head of the IWU’s department of strategy and international affairs. Germany has been committed to applied research for decades. Fraunhofer was founded in 1949, the same year that East and West Germany were created. Since the 2008 financial downturn, the country has emphasized research as a way of creating jobs and promoting economic growth, and has steadily increased funding for science at 5% a year, although that dropped to 3% between 2015 and 2020. 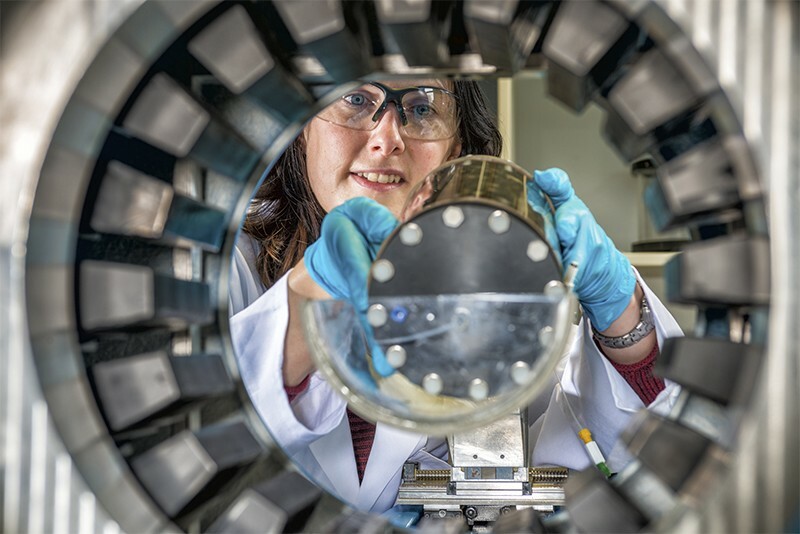 Fraunhofer is one of the leading applied research organizations in Europe, with an annual budget of €2.3 billion and a staff of more than 25,000, mostly scientists and engineers. But it maintains an academic flavour, says Ina Schieferdecker, a computer engineer and director of the Fraunhofer Institute for Open Communication Systems in Berlin, which investigates ways to improve telecommunications networks. She’s also a professor at the Technical University of Berlin, an example of the conduit from academia to industry. Fraunhofer researchers work with companies, but the institution insists that they keep their independence: researchers work with business competitors and keep ownership of their research, so that they can continue working on it and publish their results. “We are not on the company side. We are on the research side,” Schieferdecker says. Germany has a range of research institutions, covering everything from basic to applied science. The federal government runs research organizations such as the Institute for Materials Research and Testing in Berlin, and state governments manage institutes such as the German Research Center for Artificial Intelligence in Kaiserslautern. Publicly funded research institutions include the Max Planck Society, which was founded in 1948 and focuses on basic research, the Helmholtz Association, which was created in 1995 and does work that requires large infrastructure, such as fusion reactors and satellites, and the Leibniz Association, which was formalized in 1990 from an earlier collection of research institutions and performs both basic and applied research that it deems societally important. Although the research institutions focus heavily on academic research, they also sometimes behave like businesses, says Brigitte Voit, a polymer chemist at the Technical University of Dresden (TU Dresden) and scientific director of the Leibniz Institute for Polymer Research in Dresden. Researchers at the institute who want to publish a paper have to get administrators’ approval before they can submit it to a journal. The idea, she says, is not to delay publication, but to get people to consider whether there might be intellectual property in the paper that is worth patenting before it’s made public. “At least the people should be aware before they publish that maybe some of what they are doing is also interesting for transfer,” she says. The institute has close ties to TU Dresden, which aids in moving research into industry, whether through licensing or by encouraging researchers to start their own businesses. The university supports the start-up incubator Dresden Exists, which helps with the details of technology transfer and the creation of business plans for scientific ideas. Each semester, the incubator’s LifeTechLab chooses 6 teams for a 12-week session of seminars and one-on-one coaching in marketing, regulatory and customer-service issues. To further encourage people to turn their science into a business, Leibniz, Helmholtz, Fraunhofer and Max Planck have teamed up every year since 2013 to offer Start-Up Days, a two-day workshop for budding entrepreneurs that lets them network with people in industry. Max Planck Innovation, the technology transfer arm of the Max Planck Society, has established business incubators for life sciences in Dresden, information technology in Saarbrücken and photonics in Göttingen. Since 2008, it has run the Lead Discovery Center in Dortmund, which aims to transition promising research to biotechnology and pharmaceutical companies for the development of drugs. The incubators provide support for researchers who want to show how their scientific discoveries could become marketable products, says Ulrich Mahr, a start-up manager at Max Planck Innovation. The agency helps researchers to validate the marketability of their products and shepherds them along to their initial funding from investors. The German government encourages start-up companies. It provides financial support to scientists who want to turn their discoveries into businesses through programmes such as the EXIST start-up grant, which covers the salary of researchers. The grant provides up to €3,000 for people with doctorates, along with up to €30,000 for materials and equipment and €5,000 to pay for job coaches. The money is administered through a university or research institution (see ‘How to do research in Germany’), and recipients remain there while they work on their start-up firm, giving them a safety net they would not have if they immediately struck out on their own. Several resources exist to support researchers in finding jobs or funding their science. •﻿ The German Research Foundation has several funding programmes for scientists. •﻿ German Research Institutions (GERiT) provides information on 25,000 research institutions in the country. •﻿ The Research in Germany website run by the Federal Ministry of Education and Research has links to job portals and funding programmes. 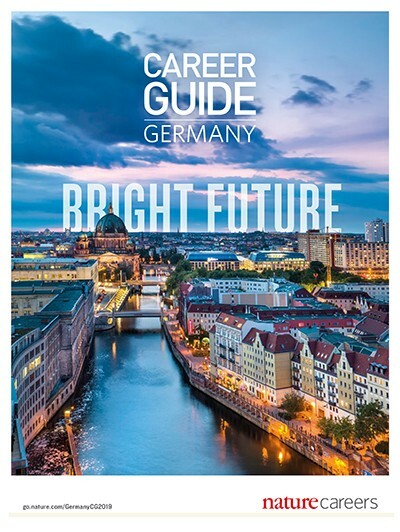 •﻿ Researchers arriving from other European Union countries and Norway, Iceland, Lichtenstein or Switzerland do not need a visa to work in Germany. Those from elsewhere do. • Information on this, and on visas for spouses, is available from the website Make it in Germany. •﻿ The Federal Ministry for Economic Affairs and Energy provides support for university-based start-up companies through its EXIST programme. •﻿ BioM helps researchers at universities and in industry to establish partnerships in the life sciences and links to research grants, and it awards two years of pre-seed funding. Indeed, a general discomfort with risk is a big factor that makes it difficult to find the funding to launch a venture. “Unlike in the United States, where sometimes you say if you don’t fail twice you’re not very likely to become extremely successful, here if you failed in one thing it’s harder to get off the ground a second time,” Mahr says. The other factor working against start-up businesses is, ironically, the strong economy, he says. Fewer people want to risk striking out on their own when there are plenty of jobs to be had — the unemployment rate was 3.3% in November 2018, according to Eurostat. Another Max Planck spin-off, the proteomics company PreOmics in Planneg, used a similar grant to get started. The firm won an M4 award — which provides up to €500,000 in pre-seed funding for two years — from BioM, an organization founded by the Bavarian Ministry of Economic Affairs to promote the biotech economy. The company sells sample preparation kits that pre-treat biological samples for easy analysis in a mass spectrometer. Founder Nils Kulak developed the technology to make his life easier when he was a graduate student at the Max Planck Institute of Biochemistry. “The German government’s extremely interested in start-ups, so there’s a lot of support,” Kulak says. To further support research that can create jobs in Germany, the Federal Ministry for Education and Research is launching an agency to promote breakthrough innovation. Expected to start in early 2019, it will award €1 billion over 10 years. The agency will fund cutting-edge R&D projects, from the initial idea to the development of a prototype. It will also have a grand-challenge programme for developing technologies, modelled on a similar programme at the US Defense Advanced Research Projects Agency, which, among other things, helped to create the Internet. “We want to hunt quite big projects that will be effective in bringing us some really nice innovations, so we can see the formation of new products, services, companies, and so on,” says Maik Eichelbaum, a chemist who handled innovation policy issues at the ministry until September 2018. “We’re looking for highly innovative and creative topics that can change the world, that can change markets, where new tech companies can evolve. Maybe 90% of the projects will fail, but that is OK because we really want to have these 10% that can make the difference,” Eichelbaum says. This article is part of Nature Career Guide: Germany, an editorially independent supplement. Advertisers have no influence over the content.